A migratory bird, the Osprey’s main breeding grounds are in Scandinavia and the Baltic regions with small breeding populations in Scotland, Wales, France and northern England. Here they arrive in their nesting areas in early spring and depart again towards the end of summer. These northern European Ospreys spend the winter in West Africa and juvenile birds will stay there for the first two years of their life. It was in the late 19th century that the Osprey became extinct as a nesting bird in Continental France as a result of persecution, shooting, nest destruction and trapping that was actively encouraged by law “C'est la classification de cette espèce en "gibier nuisible" par la loi du 7 mai 1883, ainsi que l'attribution d'une prime par tête abattue.” A payment being made for every Osprey shot and killed. 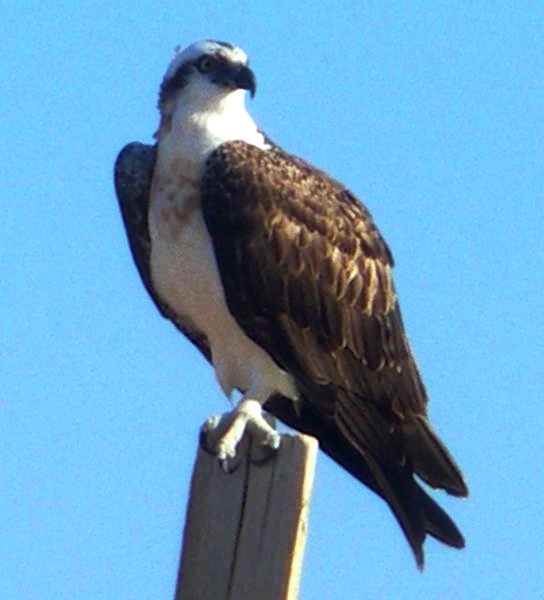 Osprey, as with all species of raptors, have been protected in France since 1972. Following this protection a small but growing number have nested in France each year but we need to divide this into two district groups. 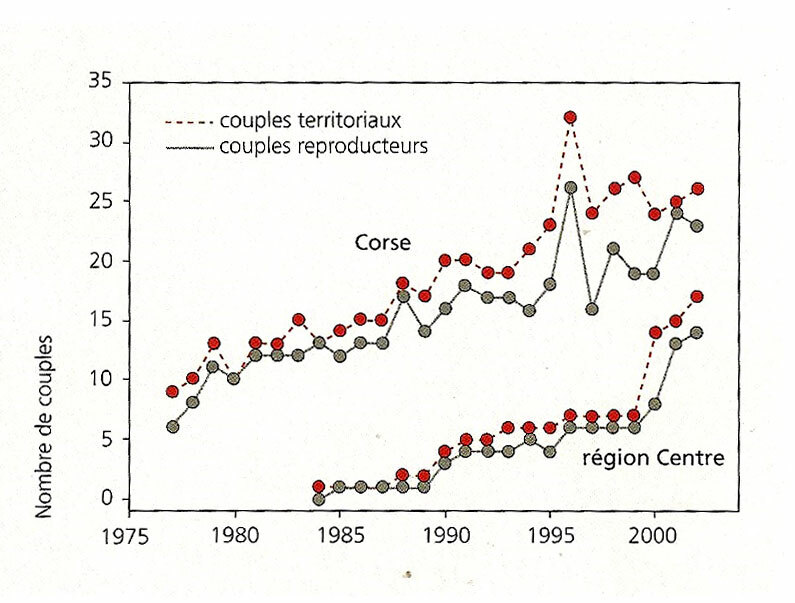 The first group never quite disappeared from the island of Corsica where there were four couples left in 1974 that have since grown to between 25 and 30 nesting couples in a zone in the réserve de Scandola in the north west of Corsica. This group is defined as “Mediterranean”. These birds are more or less sedentary having no climatic reasons to migrate and would generally seem to have lost the migratory urge, however young birds from Corsica do it seems wander around the Mediterranean region and marked birds have been observed in Italy, Tunisia and Morocco. The second group of French Osprey are migratory and defined as “Continental”. With these the first couple successfully bred in the forêt d’Orléans, Loiret in 1985 at l’étang du Ravoir followed by two other couples in 1991 and three others in 1993. In 2012 Loiret retains its importance with 20 of the 31 breeding pairs in the Centre region with Osprey also present in Maine-et-Loire, Yonne and Moselle. Tentative efforts at breeding have also been observed in Brittany and Provence-Alpes-Côte d'Azur. Eagle like in appearance, the Osprey is a very distinctive medium large bird of prey with rich dark chocolate brown upper parts contrasting with snow white under parts that is often flecked with chestnut brown in the case of females. White legs, blue talons and white head with a broad dark band though each eye. The wings are long, narrow and angled with white undersides and rows of small dark spots with black carpal patches. When seen flying towards you they have the appearance of a shallow “M” shape. The tail is relatively short and barred. 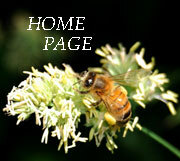 There is almost no visible difference between males and females although males tend to be somewhat smaller. 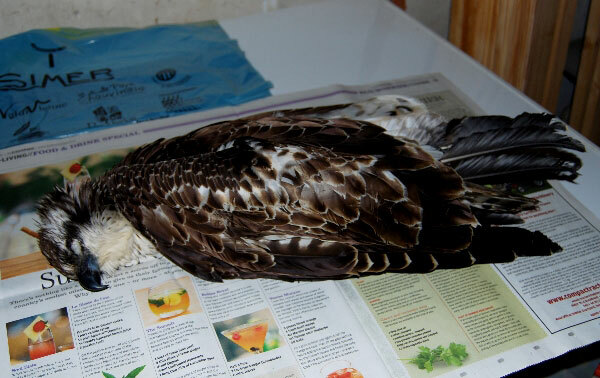 The main threat is from electrocution via overhead power lines frequently caused when an Osprey is carrying a fish that makes contact and shorts the current. Shooting still remains a serious problem possibly due to them taking fish from fish farms and leisure fishing lakes. Weight: Female 1700 g, Male 1400 g.
Life span: Up to 27 years in the wild. They do not take to being kept in captivity and will die on average after 2 years. Reproducing couples remain loyal to both each other and their nest site. Females produce 1 to 4 eggs and do all the incubating and tending for the young while the male provides her and the young with food.